Canadian retailer ‘Le Cheateau’ released their sales and earning figures this month, and the outlook for the company is not good. Sales decreased modestly from last year, with an 0.8% decrease that translates into $319 million compared to 312.7 the year before. Doesn’t sound so bad, but it’s the net earnings and stock ‘shares’ that tell the real financial troubles for the company. Net earnings for the company were down over $10 million, totaling $19.1 million compared to last years $29.8 million, with shares falling to $0.77 from $1.22 per share a year earlier. This is a sharp decline from the company’s record making year for 2009 which saw net profits of $38.6 million. So what exactly is keeping the 51 year old Canadian company from racking up the sales? Bad product? Spending-conscious consumers? Fierce market competition? Many would say all of the above attribute to why the retailer has been declining in recent years. Marc worked for the company as a visual merchandiser for the downtown Toronto stores a few years ago, and noticed the change happening to ‘Le Chateau’. The product was getting more and more expensive and most stores were given a boutique style renovation. Dress suits soon filled their mens section, and dresses became the main focus for womens wear. 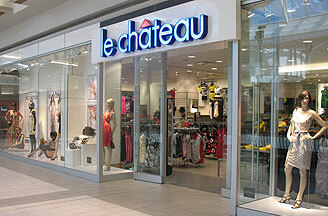 ‘Le Chateau’ had forgotten, or to make a quick profit, abandoned their ‘base shopper.’ During the time the company was morphing into a higher end establishment, the global recession hit hard. President of ‘Le Chateau’ Emilia Di Raddo, has a plan for the future of the company telling investors it will continue its focus on higher quality, European-inspired styles with broader lifestyle appeal to entice a larger client base. ‘Le Cheateau’ opened 13 new stores last year, expanded 17 stores and closed 5, which added 76,000 square feet of retail space to the ‘Le Chateau’ network.